I know sometimes you have been in an English listening exam and got totally muddled up, panic stricken and completely lost! In the exam room concentrating, then your mind wonders, you think about one certain word…and BANG the recording has moved on and you’re figuring out where the heck are we now? What do you do when you have blank spaces on your exam paper? Is there a secret technique to help us out? Yes there is! Ray shares everything in this awesome podcast. Even if you are a listening super star, Ray can help with your speaking because he is a cue-card genius! Download the podcast now, and of course remember to share it and sign up for email updates for the latest strategies and tips. A lady who was taking IELTS or wanted to do IELTS, she never tried it before. She was from Russia and she wanted to migrate to Australia. The thing that was standing in her way was not having a reasonable IELTS score at this stage. Ray: 5, 4, 3, 2, 1, Go. Ben: Hello there, IELTS Podcast listeners. In this episode we’ve got Ray Conners. He’s from Australia. And he’s going to give us some amazing tips regarding the IELTS listening exam. And he’ll probably share a few other tips as well, related to IELTS exam. Okay. Now Ray, could you just tell us a little about yourself and what you do, and how you help students, please. Ray: Yes. Yes, certainly, Ben. Thanks for inviting me. 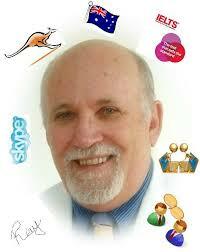 As you said, yes, I’m from Australia and I’m an IELTS teacher or coach as we like to say. Okay, yes. We have a lot of tips. I’ve been teaching… Just to give you an idea, I’ve been teaching or instructing IELTS for about 16 years now. And I do a fair bit of online these days. I don’t go into the classroom much anymore. And I train teachers who teach IELTS. So what specific questions would you like me to talk about for your clients, Ben? Ben: Right then. First of all, I get a lot of emails from students who say that when they’re in their listening exam, they have extreme difficulty coordinating both listening and writing at the same time. How would you solve that problem? Ray: I knew you were going to ask this question. I thought you were going to ask about listening as one skill and writing. But I see what you mean now. Listening to the questions and writing the answers. There’s no mystery to IELTS, really. What we have to realize… and I always tell my students this… that IELTS is not real English, as in the real world. This is a specialized type of English which we have to train for a specific examination. It’s unfortunate that what we’ve learned for IELTS, by the time we’ve done the exam and done well in it, we don’t have to worry about it anymore, then we go back to normal English (I guess you might say). Now with the listening and the writing, there’s nothing beats practice, practice, practice. Now, with listening, one of the skills… I have a special 5-listen course which I undertake with the student who have got a reasonably high level of English. And it focuses entirely on the skills only, and what’s needed. So it’s important to spend some time looking at the questions/give yourself time to look at the questions before you actually hear, and predict. For example, “What sort of a word am I going to need to do this gap fill? Is it going to be a noun? Is it going to be an adjective? Is it going to be an adverb?” Once you’ve developed some confidence in doing this, it becomes a lot easier. If you have a fair idea of what you’re going to be listening for… of course we’re not going to predict with 100% accuracy, exactly what we’re going to hear. But you’d be surprised with a little bit of practice, how skillful you can get with this. And having that confidence then makes moving on to the writing part that you have to fill in the details, etc., much easier. Ben: I see. So the listening will just get in lots of practice. And of course, not only the type of words… Like you said, an adjective, noun, or verb… It would also do good working on your vocabulary so you could generate vocabulary that you think is going to be necessary as well. Ray: Right. Exactly. Yeah. A lot of students who come to me, they get very concerned or very worried about “I don’t have a huge vocabulary.” One of the… We were able to… When we get used to listening or we’re getting reasonably familiar with English, we don’t need to know the meaning of every word. We can guess from context. We can predict from context. “It must mean something like…” So it’s not necessary to have a monstrous vocabulary. Most native English speakers never use any more than about 5,000 words maximum. So it seems quite silly to learn every synonym, every antonym that you can possible dream up because it’s just not necessary. Ben: I see. I see. Okay then, excellent. Now I’m just going to the next question. Ben: If a student gets nervous and panics during the listening exam, do you know a strategy to overcome this? If they’re like lost in the middle of the listening paper? Ray: Yes, there is a strategy to overcome this. However, the strategy you need to put it into place well before you get into the examination situation. And that is, like I said before, listen to lots and lots of things that are alike or IELTS like. And there’s a number of sites I can tell you about… and I don’t go into them right now… where you can get all of this for free. You can listen to this stuff. A lot of different varieties of accents and regional dialects and things like that. There are the Yorkshire dialects, Australian dialects, etc. So that you get to it, your ear gets trained to it. But the most important thing is, if the student gets very well practiced in the prediction of what he’s going to hear, you should not get panicked and flustered during the exam. Of course that doesn’t mean that you might not develop the jitters or the butterflies in the stomach because when we put on pressure under pressure, we do sometimes get a bit strange. And if we get lost, one of the things to think about is this: If you miss one question, it’s not the end of the Earth. So don’t panic about it. Just leave it alone and concentrate on the next one. You might be able to go back and guess the answer to that one, from the context of the other things that are in there. One of the things I always impress very strongly on my students is “Do not leave any question unanswered.” So you can go back later and say “Well, that passage seemed to be about blah, blah, blah, in question number 2. I really messed that up but it’s a pretty fair guess that it’s probably A, B, C, or D. And if you don’t know, and if you are not sure, guess. Guess. Because you got a 25% chance that your guess is correct. Ben: Yeah. And you’ve got nothing to lose. Points aren’t deducted. So if you leave it blank, it’s guaranteed zero. Put something in there, you’ve got 25%. Ray: . Exactly. So that’s what I would suggest about people getting nervous about this problem. Ben: . Excellent advice. Thank you, Ray. I have the next question. I guess you’ve kind of answered this. It’s “What technique do you suggest to improve their listening score.” It’s similar to what you’ve said before. Ray: . Learning how to predict what might be the thing. I’ve got some stuff here which I could show you… No, that’s the wrong one. Wait a moment. I will get the right one… How to predict the things you know. And a lot of these exercises are good. Here’s an exercise we can see here. And for listeners, I’m sorry it’s a little bit difficult. But what is this? What will we hear in this listening? And we can see here a little piece of paper that says “Drive from Melbourne to Port Phillip Island approximately… kilometers.” Now, we can guess pretty much what sort of thing we’re going to hear about this blank which were asked for. Of course, we’re going to say “It’s going to be a number, isn’t it?” We’re going to talk about kilometers, it’s pretty fair to predict it’ll be numbers. And the next bit takes about what? We’re talking about a drive from a place called Melbourne to Port Phillip Island. So it’s probably going to be how many… what sort of time. So it’s going to be so many minutes, so many hours, or so many days. And then the next that you know, the next thing here… This is where you put your prediction into action… People go there to observe this something returning home. Now, what returns home? Inanimate object like a tree is not going to be returning home. So we can predict, whatever is going home is going to be something that lives. So it’s probably going to be an animal, it’s not going to be flowers. So it’s going to be something that’s returning home. And the next bit is just here… I’m only using this one as an example, of course. Watch seals or something through telescopes. So what’s this last one going to be? The blank is going to be a place, isn’t it? It’s going to be some sort of place. So basically, that’s how the prediction works. Being confident in making these predictions is going to solve a heck of a lot of problems. Ben: Yeah. Definitely. Thank you for that. So this is how you teach. Using the… Just for the listeners, what Ray did was a screen share. Showed me a power point presentation and he walked through everything with the animations and everything. I’ll post a picture of that on the actual blog post. Go to the website, look for Ray Connors podcast and you’ll see there. I’ll put a screenshot there. So that’s how you teach then? Using the presentations on Skype? Ray: That’s right. That’s right. There’s a couple of other venues to teach it but I use Skype quite a lot. Yeah. That’s how it’s done. Yeah. Ben: Excellent. Now, if you only had 7 days to prepare a very panicked, stressed out, and worried student, how would you do that, Ray? So there are ways to do it, however, I think anybody who comes along totally cold and says “I want to be able to take my IELTS exam in 7 days,” unless his/her English is good, forget it. Wait for the next one. Ben: I see. So basically, you get online with them one-on-one, and then you work through them, tell them about these skills, and then basically say “Okay, do this… do this… do this…” Come back when you’ve done everything. I see. Ray: Yes. Well, pretty much. It’s like… Well, you could do it from one lesson to the next. But at the beginning of the next lesson of course, the big question would be “Okay, did you do that? How did you find this? How did you find that?” And most people who take IELTS are reasonably adult enough to be able to realize they’re facing a pretty difficult task if they’re trying to do it in 5 lessons. So they do get stuck in it and they do it. Ben: That covers for the 4 skills: Reading, writing, listening, and speaking? Ray: . Yes. Exactly. Yes. But my 5 lesson intensive course covers the 4 skills and an overview of what’s expected, pretty much from the get-go. The… Sorry, Ben. Go on. Ben: No, no, no. Sorry, I was just nodding my head. Ben: Just one more question, now. What’s the most common problem you find your students have? And how do you get them to overcome it? But anyway, part 2, let me show you something here. Now here’s a card like what the examiner will give a student. “Describe a place you’ve lived.” By the way, in part 2, a little tip. Probably over the last 30 years, 60% of the questions in part 2 have been about a person. So if you’ve developed a good vocabulary about people, it’s always like the hero from your town, or somebody you don’t like, somebody you admire. It’s always a person. So if you develop a good vocabulary about people, you’ve covered most of it. Probably 30% is about a place. So it would… a good range of usable vocabulary about a place is going to go a long way. And about the other 10% pot luck. As I said earlier, you don’t need a huge vocabulary. Remember when you’re speaking to the examiner, the examiner is going to listen to what you have to say for about 12 to 14 minutes. The fact that you don’t know any more English than what you’ve just told him is something he will never know. So there’s no need to know 1,000 different ways to talk about something that’s beautiful. Or let’s have a look at this one. It’s about a place. This is what I tell my students “You must plan. You must plan what you’re going to say.” You got a minute to plan. If you don’t use that time, you’re going to waste your effort. “Describe a place you have lived in that you particularly like.” You should say when you lived there, who you lived with, what was most memorable about this place, and explain why you liked it so much. That’s just at random. Now what I say to my students is “How many things do you have to talk about?” And of course they generally say, “Oh, 4. When I lived there, who I lived with, what was memorable, and why I liked it so much.” Wrong. There’s 5. You have to talk about the place, right? So I say, “Make a little mind map. Write down what it is you have to talk about. And then the next part is who. Who you lived there with, when you lived there, why it was memorable, and why you liked it.” Those are the 5 things that the question asked. You must direct your attention to each and every one of them. Miss out one, you’ve just blown 20% of the mark that you might get. You’ll also need to rephrase the question just like as if you were doing it in the writing. Like a 5 paragraph argumentative essay. You have to rephrase the question. It could be something like “Oh I want to tell you about the place that I have lived when I was younger.” Or “I want to talk about…” “Let me tell you about…” and then you start. But also with this mind map. Okay, the place. What country is it in? For example, where is it’s location? The part about when, when did you leave there? Just as an example, “In childhood, I went to school there during my childhood.” Who did you live there with? “Oh, my parents.” Some say something about my parents, “they’re retired.” “And I also lived there with my brother who is now an engineer.” This is all just to pad out. To keep talking. You need to have more to talk about than you really need. Why is it memorable? “It had a long stair. That is why I do remember that. I was always afraid to fall down. It had a swing outside and I can remember my dad made it.” Why did you like this place? “It was full of happy memories when I played with my friends.” And then you have to round it up. You have to… Along with like an essay, you have to say, it has to be virtually in 3 parts. You say what you’re going to talk about. Talk about it. Talk about what you just talked about. Say about what you just talked about. So to let the examiner know you’re finished, “And that’s my little story about a place I really liked living in. I hope you enjoyed my talk.” And you have to practice, practice, this to make sure it goes for between 1 to 2 minutes. Closer to 2 minutes is better than 1 minutes. So that’s the major problem most of my students have. It’s a, not answering the question that’s asked, and b, part 2 speaking is where everybody freaks. And so I concentrate on that and I get people to practice this again and again, and time them. And say “You go on your own time and use all they used,” and I give them a dozen or so speaking cards, and I say “You record it, practice it, until watch the timing. Make sure that you cover every point and make sure that you can do it in the time.” That way, you walk away giving the examiner everything that he is expecting: You stand out. You stand out. Ben: Wow that is awesome advice. Thank you so much for that, Ray. That is an absolute gem. So just to summarize. So you’ve got the question. First you analyze the question really well. And even if there’s 4 bullet points there, you have to remember the first sentence. In the case you just showed it was about describe a place, and then you’ve got the bullet points. So you’re saying structure it around all 5 sentences. And then get a mind map going to generate content for your talk. And then structure it the same way as an essay. But of course using a different language. Using spoken English rather than formal academic. Ben: And you just maybe try and get comfortable with a few set phrases or “Okay, I would like to talk about…” or “My little story is going to be about a place where I lived,” or something like that. Then you go into your mind map which you generated, then you prep for the content, and then you give like a little indication to the examiner that you’ve finished, using a very natural sounding phrase like “Well, that’s my story about a place I lived when I was younger. I hope you liked it,” something like that. Excellent advice. Ray: Right. Because rounding it all up is letting the examiner know “Oh, I’ve finished now.” Because too many people say “and that’s it.” And the examiner suddenly thinks “Oh well, that’s a good job gone down the hill.” It’s all about giving the examiner what the examiner expects. Ben: Exactly. Yeah. And trying not to make the examiner work, making sure that they understand you. Making their life easier as well, I imagined. Ray: Exactly. I mean if you’re an examiner and you’ve been sitting there and you’ve just had 100 interviews and Ben: comes along and he’s terrible like the rest. He’s bored. The examiner is bored. He wants to hear something different. And when you come along and go “Bingo” and give him exactly what he’s looking for, you stand out. You’re better than the rest. So he’s inclined to mark you up. Ben: Excellent advice. Thank you for that, Ray. Now final question. Could you share a success story that you’ve had with a student and like what the situation they came, what you did and how you helped them? And what happened afterwards? Success story or even a funny story. Ray: There’s quite a few good ones. Oh, yes. I won’t mention names because that would probably be a problem. But a lady who was taking IELTS or wanted to do IELTS. She never tried it before. She was from Russia and she wanted to migrate to Australia. The thing that was standing in her way was not having a reasonable IELTS score at this stage. Her level of English was probably what we would call intermediate. She was a doctor. She took IELTS with me and we had the time to do it, so there wasn’t the rush. It wasn’t I combined what we call the intensive IELTS course with also adding vocabulary and learning some new vocabulary to go along with it. We worked probably I think it was 2 lessons a week for about 6 weeks. So she had about 12 lessons with follow up stuff. Her main purpose she was about… She was in her early 30s. And in Russia, if you’re a woman in your early 30s and you’re not married, you’re over the hill. You’ve lost the plot. And she was a very good-looking lady and very intelligent. And she wanted to get a big bronze Aussie life saver for a husband. So that was her plan. So she went along a little bit nervous to the exam but she was very well prepared. I knew I had every confidence that she would do well. So she went to the exam and after the exam was all over, I got a wonderful message from her to say “Right on your prediction. 6.5 for every skill. I’ve just bought the ticket for Australia. I’ve been accepted.” She got to Australia, she got a job within a week in her field. Although obviously she’d been canvassing prospective employers. Now, I have to tell you, when she got here there were so many good looking bronze life-savers but she still hasn’t made her choice. But she does have a choice apparently. So there was one. Another guy in Russia. He was a pre-intermediate level and he wanted to take IELTS to better himself in his position so he can deal with foreigners. Isn’t it strange that we have to have a piece of paper to prove that we can speak English well? Which is a little bit silly but that’s how it is. So he was only looking for 4.5. And from a very low beginning, we took… it was about 20 lessons. And he managed to achieve and he got a promotion in his job which is in Siberia… But that’s where he liked to live. So yeah, there’s a few. But those are the ones that really stand out because they were memorable. Especially the guy who got the 4.5. He was such a hard trier. And he eventually did well. Ben: When you was talking about the girl, I thought you was going to say “She came to Australia, she got 6.5 and then she came to my house and asked me for a date…” That’s how it went. Ray: No. I’m already married, babe, so… Although she was a little tempting, I do admit. She was very good-looking. Ben: Awesome. Okay. Well, that has been an absolutely fantastic interview. And thank you so much. And just for the students listening, if you would like a class with Ray, you’ve probably heard more than enough to be convinced. Have a look at the… go to the IELTS Podcast site. Maybe do a search for Ray Connors, and you’ll get all the details. And I’ll also post some of the pictures of the actual presentations he showed me during the interview so you can have a full look and get all the details there, get more information. And hopefully get in contact with him. Right then. Well, thank you very much for that, Ray. Thanks for listening to ieltspodcast.com. And remember to leave your email for updates and early access to new podcasts. I would like to link this splendid website. Thanks in advance.